This past weekend saw my wife and I making pizza and some lovely White Bean and Kalamta Olive Soup. The link to the recipe was the best I could find on the web. The one I use is from Mollie Katzen’s cookbook, which I have no right to place on my blog, please buy her book she is a genius! The soup is simple to make, and I follow her recipe to the tee, short of adding in a wee bit more wine than her recipe calls for. Personally, that is the ultimate compliment, using someone’s exact recipe, with little or no change, because it is perfect as it is. Besides the soup, we made some pizza as well. I must say that making kosher pizza now days is really quite simple. We buy ready made whole wheat pizza crusts that are very tasty, reasonably priced, and a cinch to complete. All we do is take the ready made crust out of the package, or freezer, throw on some tomato sauce, pre-shredded pizza cheese, sliced onions, and olives. On top of that we throw on some herbs and we are good to go! Benyamin from Four Gates Winery was by, and we tasted through the new wines that will soon be available on the website, stay tuned for those notes! Though some of the wines could have held up against the pizza, I went a different route for the meal, we bought a bottle of La Fin Du Monde. This is a Belgian Tripel style Ale, which has lovely bits of yeast lees that the beer can lie on and age for a few years, if stored properly. The beer’s rich mouth, along with its mild bitterness, and unique spice flavor profile makes this a perfect compliment to pizza, rich pastas, light to medium meat or seafood, and rich deserts. The nose on this cloudy light gold colored beer starts with sweet malt, banana, heady spice, cloves, lots of foam and nice effervescence. The mouth on this medium bodied beer is rich and spicy with a frontal attack of cloves and coriander, followed by rich yeast, and toasty malt. Apple comes in along with a bit of citrus, all clinging to the rich head and mouth and making for a lovely spicy experience. The finish is long with more spice, honey/caramel, apple, citrus peel, and pepper. The high alcohol does not affect the taste, but beware of this puppy as it can catch up to you quickly if you take it for granted. 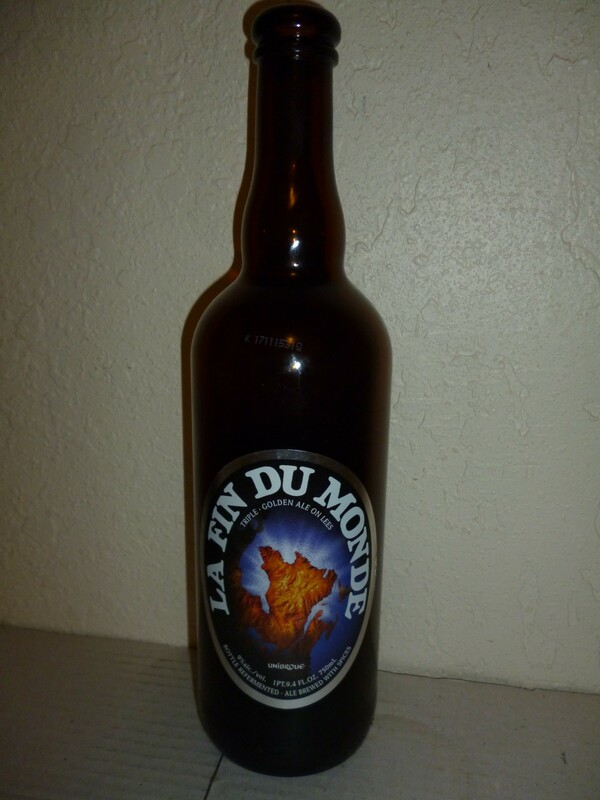 Posted on February 7, 2012, in Beer, Food and drink and tagged beer, La Fin Du Monde. Bookmark the permalink. Leave a comment.